This hearty sub is loaded with a quarter pound of freshly sliced beef brisket that has been hickory smoked for at least 10 hours in an authentic smokehouse. 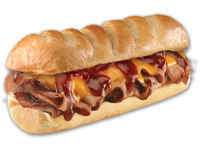 The brisket is then steamed with melted cheddar cheese, and piled high atop a toasted sub roll. Divide mayonnaise and BBQ sauce between two halves of roll. Steam meat lightly to heat through and melt cheddar cheese on top. Pile meat and cheese on roll.